This map of the British Isles dates from the period 1534-46 and is by an unknown draughtsman. The source of this map is thought to have been a map of around 1290 which also acted as a source for the Gough Map of 1360. The cartographer has made significant advances however on this early source map; Ireland is included, shown as an egg shaped island with the fabled Purgatory of St Patrick, a large internal lake populated by many islands to the north west. The outline of Scotland is improved, the cartographer having rejected the contorted Ptolemaic shape of Scotland in favour of a roughly accurate outline. This improvement in the shape of Scotland is because the map is graduated for latitude and longitude (apparently from the Azores), It is the earliest surviving British map to be so. Ireland and Scotland are tinted yellow to distinguish them from England and Wales, but their inclusion on a map of 'England' reveals Henry VIII's hopes for expanding his kingdom. A date of around the late 1530s is probable as the map does not show the advances in knowledge of the coast of Scotland and Wales, notably the outline of the Bay of Cardigan, which was known at court after 1540. 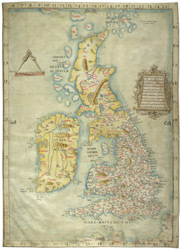 It is possible that this map belonged to Henry VIII and was one of several known to have decorated the galleries of the various royal residences. It is the first known map to record 'hampton corte' raising the possibility that this is where it may have originally hung.